A short 15-minue drive from Minneapolis, you’ll find some of the most prominent homes in the entire greater Twin Cities Metro area and some of the wealthiest residents in MN residing in Wayzata along the shores of Lake Minnetonka – in zip code 55391. If you’re looking for a home near Lake Minnetonka, Wayzata is a wonderful place for family, entertainment, education and more! Housing: Wayzata home prices vary greatly with the estimated median house value in 2012 at $355,000. The average median home price is significantly higher at $582,000 due to sales of many multi-million dollar estates which skews the average. Finding a home in Wayzata or Lake Minnetonka takes local expertise, and it’s helpful to know the neighborhood personalities and features. Premier Wayzata neighborhoods include Ferndale Woods, Westmarch, and Wayzata Highlands. More affordable communities include Wayzata Terrace, Wayzata Heights and Holdridge.Statistics: The city of Wayzata proper sits on approximately 3-square miles, with an estimated population of 3,688 – according to 2010 U.S. Census data. This small haven provides the best of many worlds: Village feel with unique retail and dining, excellent education opportunities, proximity to Lake Minnetonka as well as downtown Minneapolis and Saint Paul. Economy: Wayzata has managed to retain its small town charm while maintaining a vibrant business community. 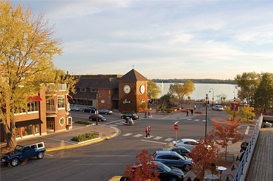 This unique area packs a great deal of variety into its borders, supporting two distinct business districts: The “Uptown” area, marked by the shops at Colonial Square on Wayzata Boulevard, and the “Downtown” area with it’s many restaurants, boutiques, and professional businesses on Lake Street in view of Lake Minnetonka’s Wayzata Bay. The Greater Wayzata area Chamber of Commerce is the active center of the area’s business networking and community events, hosting the popular J.J. Hill Days & Parade, the Wayzata Art Experience, The Chilly Open, and more. History: Wayzata enjoys a long history and gets better with age. Sioux Indians first settled on the land around Lake Minnetonka and cherished “Big Water” along with the rich hunting and fishing grounds, and the first pioneer families settled on the land in 1852. Five years later, the tourist boom brought the well-to-do from all over the country flocking to Lake Minnetonka’s many hotels and tourist attractions. While Wayzata incorporated as a city in 1881, it shifted from a resort town to a new cottage era during the Great Depression as many residents modified their summer lake cottages for year-round living. Schools: Wayzata is served by award winning Independent School District #284 which also serves approximately 9,510 students in all or part of Orono, Minnetonka, Medina, Plymouth, Maple Grove, Corcoran, & Medicine Lake. The Highcroft Campus (K-5) of the prestigious Blake school also call Wayzata home. Getting there: The City of Wayzata, MN is a located in Hennepin County, approximately eleven miles west from Minneapolis. Wayzata rests along the North East Shores of Wayzata Bay on Beautiful Lake Minnetonka. The city can be accessed from the main I-394 Highway corridor which turns into U.S. Highway 12 West.